Historically, the systems that managed security and access control were located on-site. These systems contain computer equipment, storage devices, and software to run various applications. While some systems require on-site equipment, more systems are now cloud-based. Cloud-based solutions work for many different businesses. Some common applications include retail, medical offices, daycare, multi-tenant buildings, warehouses, and off-campus housing. Cloud-connected systems have very few limitations. One exception is limited bandwidth. Limited bandwidth can be a choke-point for data-heavy systems such as major video surveillance operations with many cameras. Small to mid-sized video surveillance systems are perfectly suited for a cloud-connection. A formula accounting for the number of cameras, frame rate, and resolution, will determine if a cloud-based solution is possible for your surveillance application. A second limitation is restricted internet access. A prison or government agency, for example, may not want their security system connected to the internet. However, there are most applications can still utilize off-site hosting. Operational interruptions are eliminated with off-site hardware, software, and maintenance. It’s no longer necessary to schedule a technician to perform maintenance, updates, or service. This is all completed off-site by your security partner. The initial investment is reduced by eliminating on-site server hardware. No local servers are needed for cloud-based systems. With a cloud-connected security system, scalability is a breeze. Now, a system at headquarters doesn’t need to be able to communicate with a remote building or location. Each location is connected directly to the cloud with a standard internet connection. This also cuts down on initial and ongoing IT support. Aside from hosting your system in the cloud, your system can also be managed remotely by your security partner. 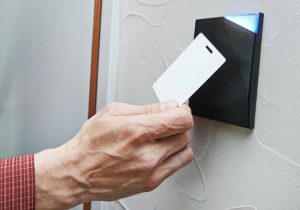 Systems like access control can be programmed and maintained by a third party. This eliminates the time required for your team to enter new employees, remove past employees, and issue new card credentials or badges. Remotely Managed Access Control, or R-MAC, by Securitronics provides these cost-saving operational benefits. Cost reductions from software elimination, hardware elimination, and off-site maintenance are just the beginning. Our team handles the administrative tasks as well, freeing up your team to focus on business operations. Select from a variety of hardware, including hands-free proximity or biometrics. It’s easy to budget for R-MAC and you’ll have controlled monthly costs for all services. Installation and setup of a complete package with control panel, locking hardware, and wiring can be accomplished for most customers in a few hours. Plus, security cameras can be connected to the same hosted managed service, providing a one-stop solution for your company. There’s not a specific total cost of ownership per security camera or access-controlled door. Every application is different. However, stakeholder inclusion and proper project planning will help you to deploy and maintain the best possible cloud-based solution. An experienced security partner is an excellent advantage. A security professional can visit your facility to collaborate with administrators, security staff, IT, department leaders, and other key stakeholders. The resulting plan will be a tailored and comprehensive security solution that improves daily and long-term operations for every department.